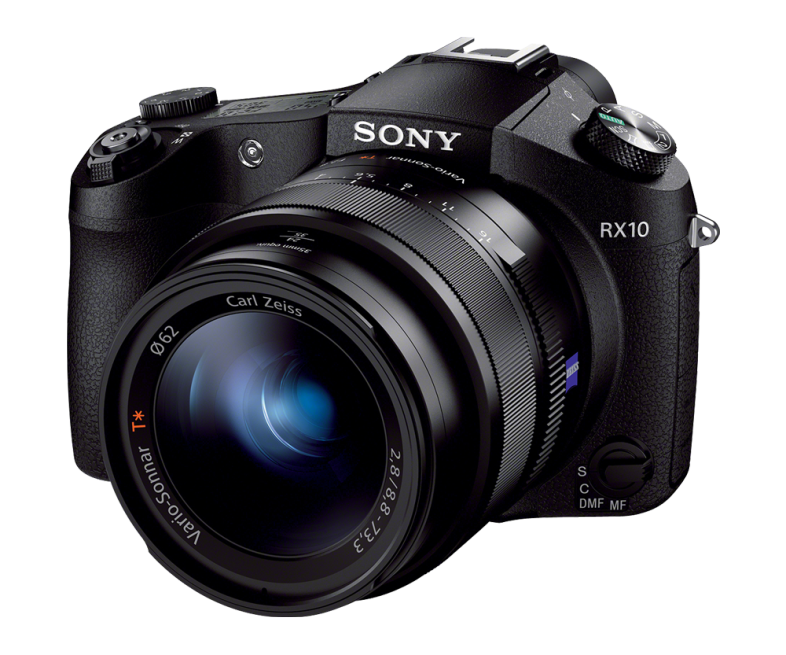 The new Cyber-shot RX10 camera adds a high-zoom model to its premium line of Cyber-shot RX series cameras. The original RX100, and the subsequent RX100 II, if you aren’t already aware, is an excellent compact camera with a largish 1″ size sensor producing excellent 20 megapixel images rivalling those of low end DSLRs. The new RX100 upped the ante by providing a zoom that goes from a wide angle of 24mm (35mm equivalent) to a focal length of 200mm, useful for birding, zoos, stage work, concerts etc. This is the camera to take to a Justin Bieber concert, provided the guards let you in. This unique pairing of large, high-resolution sensor and premium zoom lens is complemented by an advanced BIONZ™ X processing engine and AF system, ensuring that all content shot with the new RX10 camera – still images and full HD videos alike – is richly detailed, crisp, and continually in focus. The new RX10 camera shares the same high-resolution, 1.0-type 20.2 megapixel Exmor ® R CMOS sensor used in Sony’s popular RX100 II compact camera. About 4x the size of a standard compact camera sensor, it excels in producing high quality images in all types of lighting conditions. The BIONZ X processor is about 3x faster in processing speed compared to previous BIONZ predecessors, and reinforces the impressive image quality of the sensor by applying new detail reproduction technology and area-specific noise reduction. It also utilizes diffraction-reducing technologies, which compensates for the lens diffraction at smaller apertures. The new Cyber-shot RX10 camera also features an extremely speedy and responsive new contrast-detection autofocus system thanks to a new-generation Direct Drive SSM (Super Sonicwave Motor) mechanism that works with the Exmor R CMOS sensor and powerful BIONZ X processor. The new RX10 high-zoom camera can shoot at up to 10 frames per second with continuous autofocus. This capability combined with the advanced AF and versatile 200mm, constant aperture F2.8 lens makes it an outstanding choice for shooting fast action and sports. The camera also features a high-contrast OLED Tru-Finder™ that provides crisp edge-to-edge visibility and a wide viewing angle of about 33°, as well as a clear, bright 3.0-type White Magic™ LCD tilts up or down for easy framing for even more compositional freedom. Aesthetically, the new Cyber-shot RX10 features a variety of fully customizable controls and settings that offer DSLR-like flexibility for advanced users. The lens itself has a manual control ring that can be used for zoom or focus control, as well as a dedicated aperture ring that can be set to ‘stepped’ (clicking) or smooth and silent (very useful for movies) when making adjustments. The camera has six different customizable buttons plus a top-mounted LCD for instant confirmation of exposure and other key settings. The camera has a premium feel thanks to its light, rigid magnesium alloy build, and is also dust- and moisture-resistant for use in outdoor situations. The RX10 model has on-board Wi-Fi for easy connection with any iOS or Android™ smartphone, and features NFC (Near Field Communication) one-touch for simple connection to NFC-enabled Android devices. Consumers can share photos wirelessly on a connected mobile device, HD TV or home networked devices. Additionally, a connected phone can be used as a smart remote control to fire the camera’s shutter. This entry was posted in Photography and Gear News and tagged cybershot, RX10, sony by David. Bookmark the permalink.